Still a ridiculously long list to narrow. You are at a disadvantage here due to not have a composition that includes a good shot of the legs. A quick look back at the master directory did find have some that were not worthy of processing but had more of the legs. I only mention this because they were definitely NOT yellow but black. This allowed me to strike the Yellowlegs off and the Solitary Sandpiper. While checking off the easy indicators I went ahead and validated the regions. 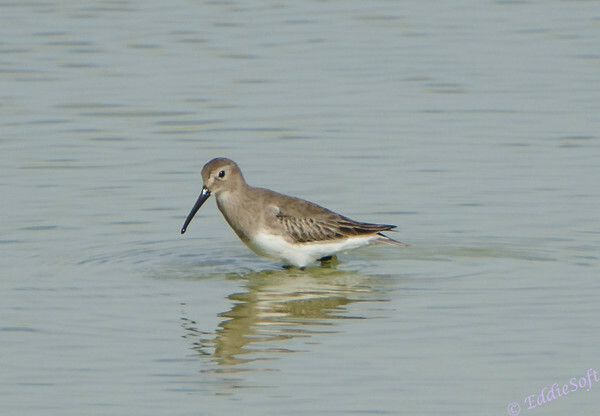 Goodness, the Stilt Sandpiper doesn’t frequent Nevada so that is out along with the Short Billed Dowitcher. We are now at a list size that I prefer to start with. Next area to concentrate on is the coloring and in particular the fairly solid gray neck that merges into the primarily white breast should give us some pruning. The Long Billed Dowitcher adults do not have a white breast (more orange speckled for Summer and gray for Winter ) but the 1st Winter juv is closer but the tail coloring is more spotted. Taking that off the list. 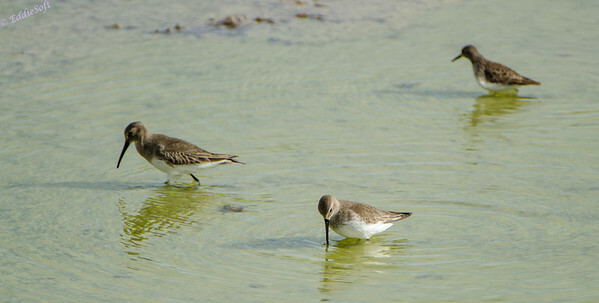 The Dunlin actually shows a similar Winter coloring, but the shape just doesn’t seem to doing it for me – it’s gone. The outer feathering shows definite white line highlights. This is not a styling displayed by the Green Sandpiper or the Solitary Sandpiper so thankfully able to remove those very close option. Wow, getting close but still not able to pull the trigger yet. I am really running out of deciding features. The Willet has less of a white line at the eye region where the Curlew has more of a full line giving a nod to that one. 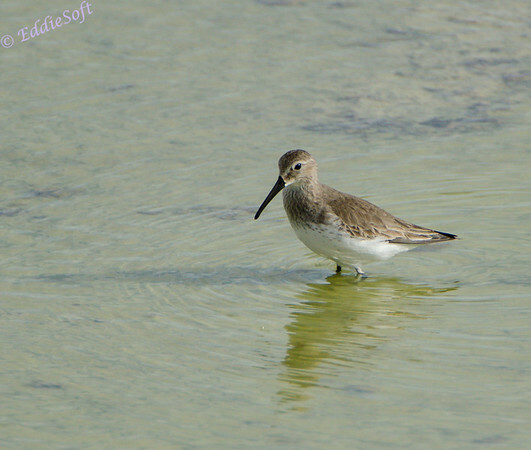 Both have long legs which the images fail to provide any insights in being as they are mostly wading up to their breast, but the Willet has less of a dark coloring on the legs than the Curlew giving it another point. A closer look at the Curlew also shows a more solid bill that is almost identical to the subjects here – three points Curlew. Is there anything that can be discerned from the “birds in the vicinity” shot? Eh.. not a lot other than I am not sure if the one farthest back is really in the same species – maybe more of a traditional sandpiper. Essentially no help there in my opinion. It maybe time to make the call. Gotta go with gut feel on this one. The winner is … the Barn Swallow. Before the comments start pouring in I better explain myself a little… er, more like explaining something I learned from my brother Ron. He is usually my ID verifier and with all the difficulties this bird was bringing to the table I decided to enlist him before the actual post and asked him to look at the pictures ahead of time (revealing my posts ahead of time is definitely a rarity around here preferring to build excitement over the unknown). Through his wisdom I learned about a movie that came out in 1962 (before I was born by the way) called Mr. Hobbs Takes a Vacation. From the summary it looks to be a family wholesome movie gaining a 6.7 on the IMDB rating system and some very positive comments. Ron brought this up due to a running subplot where Jimmy Stewart, Mr. Hobbs, proceeds to identify all the birds as .. you guessed it Barn Swallows. His stuttering provided the extra comic relief since everyone knew the answer before it made its way out. As you probably guessed, his response on my later request to assist in identifying this particular bird was “A Barn Swallow”. “You’re a funny guy, Sully I like you.” In case you are new to birds or maybe live in Chicago, there are only two options that made it out of my identification process. Taking the Swallow off the list leaves the Willet and the Curlew. 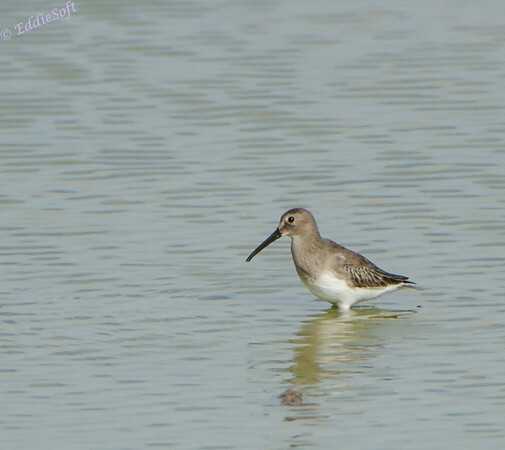 Eenie Minee … let’s just go with the Curlew Sandpiper. Please, Please offer up any other suggestions you might have along with a brief description on how you came to that conclusion – this will allow me to validate it and maybe even enhance my own process for future classifications. My apologies, but there really isn’t a lot of facts related to this bird (assuming it is a Curlew). It has a conservation status of Least Concern if that is interesting enough for you but in truth didn’t want to pile on a lot of background based on the skepticism on the classification. By the way, did try to see if there was any sightings of it in the area. According to this site (link here), there were some definite Long Billed Curlews there but didn’t really call out the others. Oh well, if birding was easy I probably wouldn’t enjoy it so much. Egads, I may have been mistaken–it may have been his birder buddy who kept saying that, based on what I’m saw flipping around online. You sure we oughtn’t to have at least a cup of coffee? Worst possible thing you could do. Never fill yourself up with a lot of slosh when you’re taking the field. That’s one of the first lessons a bird spotter learns. He travels best who travels empty. What are…What are those up in the tree there? Easy to spot. Barn swallows are the only ones with white spots under their tails. Interesting call, the barn swallows. You’ve never done much walking, have you? Only since I was about two years old. You don’t walk right. You walk with your knees stiff. You’ll never last that way. Bend them a little, like this. Of course, this is exaggerating, but it’ll give you the idea. Almost as if you were sitting down. You’re coming down too hard on your heels. Try having the whole foot hit the ground at the same time. And toe in, don’t toe out. We’d better get the walk straight first. One, two. Now you’re getting it. You’ve got the wrong shoes too. For walking, you need shoes that hug the feet. See these? See how they hug the feet? Barn swallows. Nothing at all. Emily and I both get all our walking shoes in Austria. Do you think we’re too early? Not over there. Over there. There. First species of the day. [ Squawking ] Now you spot one. Ah, just as I thought. A sharp-shinned hawk. Ah, by George, we’re doing all right. Two already. At this rate we oughta be able to spot more than 30 by the end of the day. [ Whispering ] What? Where? Which way? Ever see a red-eyed vireo? First one I’ve seen this year. What’s that little fella next to it? for at least 30 hours. Do you know what that is, Hobbsy? That is a great blue heron. you are going to be a capital birdman. I think this sets a new record for longest comment ever! I had to read the script a couple of times now, but I’d say that it is Hobbs who is at least responding to the identification question with Barn Swallow but it is clearly not Hobbs that is the birding EXPERT which sounds so much more appealing that NUT (regardless of how accurate the portrayal was hehehe) Note, I can agree with the not wanting to fill up on liquids – most of the places we go are not exactly bathroom friendly – well, at least for Linda – us males have one distinct advantage there proving again we were intelligently designed or perfectly adapted for birding. Thanks for the research – will have to keep an eye out on the classics channel to see if it ever pops up – not a big old school movie watcher but now I am intrigued enough to give it a viewing should it conveniently show up on the channels. The big question remains unanswered — do you agree with the final classification? It was just a short but memorable segment in the movie–the movie is apparently in color, but I saw this part so long ago that I saw it on a black-and-white TV. I was just a kid, so that’s why I have an imperfect memory of it. I found the trailer yesterday and it looked pretty bad overall, although it does get good reviews. You know, looking through all the photos again as well as your list of possibilities, my conclusion is that it’s definitely a barn swallow. Definitely. 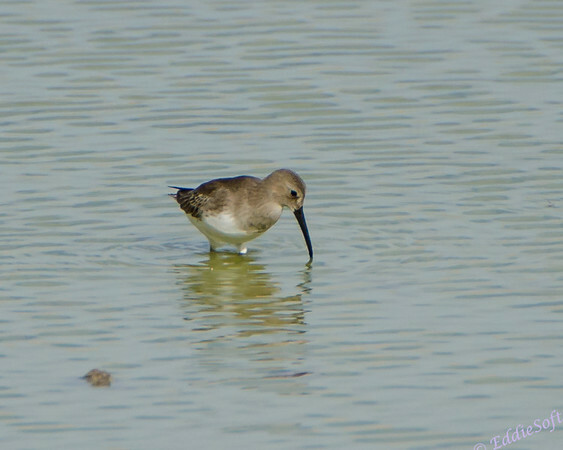 Or if not, a Curlew Sandpiper.